CLT Update: 09 Mar 09 - So-Called Mass. Taxpayers Foundation, Big-Business Fat-Cat Allies, Stripped Naked! Big-Business Fat-Cat Allies, Stripped Naked! Bay State working families are bracing for a wallet-crippling gas-tax increase, but five nonprofit executives pushing for a 25-cents-a-gallon hike won’t personally feel the pinch as they all earn six-figure salaries, with some enjoying company cars and gas reimbursement. But Barbara Anderson, spokeswoman for Citizens for Limited Taxation, accused the executives of pandering to big businesses. "The political stakes are high, but the leadership here is necessary," said Paul Guzzi, president and CEO of the Greater Boston Chamber of Commerce. "This coalition is profoundly out of touch with the struggles of working men and women of our state," said Senator Steven A. Baddour, a Methuen Democrat who cochairs the Legislature's transportation committee. Michael Widmer, president of the Massachusetts Taxpayers Foundation, said he worries that a compromise on a lower figure could leave lawmakers taking a tough political vote without raising enough money to fix the Massachusetts Turnpike, keep fares down on the MBTA, and improve regional transportation. By starting with a higher number, advocacy organizations may be hoping to shift the debate so that any compromise figure will be closer to Patrick's number. At last! 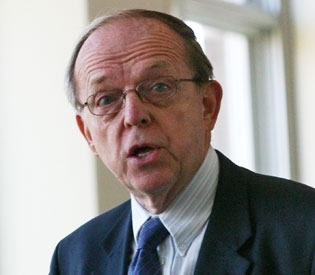 Boston Herald reporter Dave Wedge has shattered the last vestiges of sanctimony so long bestowed upon the so-called Massachusetts Taxpayers Foundation and its "nonpartisan" and "enlightened" advocacy. For years, CLT has been raising the alarm that the so-called Massachusetts Taxpayers Foundation is nothing more than a powerful lobbying group for greater-Boston Big-Business Fat-Cats doing nothing else but looking out for their own interests and bottom lines, filling their private coffers at the expense of average taxpayers. Our "Trojan Horse" web page dates back to 1991, illustrating how much MTF has been and is an enabler for higher taxes on average taxpayers and more government spending to profit its fat-cat members. When the media finally dropped its standard descriptor, "highly-respected," and adopted instead "business-backed" we saw our first break-thru! On Feb. 20, 2002, Boston Herald business reporter Cosmo Macero Jr. wrote his column, "Tax group turns left on hikes; Conservative watchdog group backing tax, fare hikes." In our Update of Feb. 22, 2002, I wrote, "To the best of my knowledge, this is the first time anyone in the media has bothered to take an honest, objective look inside the Trojan Horse." We've had IRS filings from the non-profit MTF for years, but couldn't get anyone to look at them, to calculate who was making how much for what from whom. Now it's out there, thanks to Dave Wedge. Michael Widmer's salary alone is significantly more than CLT's entire annual operating budget! Remember MTF's "nonpartisan" and "objective" opposition to Carla Howell's Question 1 last November, the ballot question to repeal the state income tax? Remember who else signed on with MTF? I certainly do. If you don't as well, let me remind you. There's that Greater Boston Chamber of Commerce and that Massachusetts Business Roundtable again, today calling for an obscene gas tax hike! Do I detect a pattern here? CLT put it all out there in a news release on Oct. 8, 2008 -- MTF “Analysis” – Pure Political Propaganda. They got away with the scam, helped defeat Question 1, and thought they could continue with plundering average taxpayers with impunity. They have finally overplayed their hand, it appears. Widmer and his big-business fat-cat cohorts have been pushing for an expansion in the sales tax too for as long as I can recall-- so watch for that coming to a theater near you soon! Michael Widmer, president of the Massachusetts Taxpayers Foundation, supports the drive to hike the gas tax even higher than Gov. Deval Patrick’s 19-cents-a-gallon proposal. Widmer rakes in $375,000 a year in salary, $19,000 in benefits and deferred compensation and was paid $2,837 for expenses, according to 2007 IRS filings. Widmer said his compensation includes a car allowance and reimbursement for fuel expenses. Richard Dimino, president of A Better City Inc., who earns $335,200. Begelfer said he didn’t factor his personal compensation into his decision to back doubling the gas tax. Dimino, who also does not have a company car, said people at the lowest end of the economic spectrum will suffer if nothing is done. MacDonald said the five organizations are responding to years of neglect and dire reports from transportation experts. Massachusetts business groups yesterday endorsed a 25-cent increase in the state gas tax, a more aggressive hike than Governor Deval Patrick's 19-cent request, saying that the state needs to move even faster to fix its ailing network of roads and bridges to encourage a strong business climate. The business leaders compared the current push for a transportation overhaul to the effort that led to the state's new comprehensive healthcare law, saying that the costs to motorists and businesses are worth it to fix chronic money shortages that have plagued the system for more than a generation. A 25-cent increase would generate about $650 million a year in new tax revenues for the state. Guzzi was joined at a media conference in downtown Boston by leaders from the Massachusetts Taxpayers Foundation, the Massachusetts Business Roundtable, A Better City, and NAIOP Massachusetts, a commercial real estate development association. Patrick welcomed the move but some in the Legislature, where support for such large increases in the per-gallon tax has been uncertain, said the business groups were insufficiently focused on the pain it would afflict on motorists. Either of the plans pushed by the governor or the business groups would give Massachusetts the highest gas tax in the nation. Senator Richard R. Tisei, the Republican leader from Wakefield, echoed Baddour's earlier comments that many supporters of a gas tax increase were "elites," and said higher gas taxes were a greater concern to smaller businesses. The oft-fractured business community has rarely linked arms to support higher taxes. "I've been involved in politics in Massachusetts now for 25 years and I am honestly not sure that I can remember another time where the business community came out in such an organized way on behalf of a tax increase," said Marc D. Draisen, a former Democratic legislator and executive director of the Metropolitan Area Planning Council, which advocates a 29-cent increase. A higher gas tax might also reduce the pressure on lawmakers to raise corporate taxes - which some of the groups have sought to reduce or hold steady. The business groups argued yesterday that more money for roads will retain and attract business, move workers, spur development, and put people to work on fixing roads or expanding rail. "It's certainly not about elitism. It's about getting people to work," said Richard Dimino, president and CEO of A Better City, a transportation-oriented business group that had been a key business supporter of the Big Dig. The coalition emphasized that significant structural changes under discussion in the Legislature, including reductions to MBTA fringe benefits, need to play a larger role in the debate and go hand-in-hand with higher taxes. Patrick's plan has generated some skepticism in the Legislature. Michael Widmer, president of the Massachusetts Taxpayers Foundation, said he worries that a compromise on a lower figure could leave lawmakers taking a tough political vote without raising enough money to fix the Massachusetts Turnpike, keep fares down on the MBTA, and improve regional transportation. By starting with a higher number, advocacy organizations may be hoping to shift the debate so that any compromise figure will be closer to Patrick's number. "It's just basic to our economy that transportation and general infrastructure is really so necessary," said Alan G. Macdonald, executive director of the Massachusetts Business Roundtable. Macdonald was a member of a statewide transportation finance commission that had suggested many of the structural changes being advocated by Patrick and the Senate, as well as a more modest gas tax hike. David Begelfer, CEO of NAIOP Massachusetts, cited the state risks of losing companies that are hemmed in by bad transportation access. "We'll never know the projects that were never built" because of a lack of road access, he said. One notable exception to the pro-gas tax business group: Associated Industries of Massachusetts, the largest state business organization, said it opted out of the 25-cent plan because, though higher gas taxes will eventually be necessary, its members outside of Boston worry that they will not benefit. "Given the economy," said Brian Gilmore, Associated Industries' executive vice president, "we really believe it would be prudent to do the reforms first and then focus on funding." Patrick and his transportation secretary, James A. Aloisi Jr., have been traveling the state in hopes of persuading commuters, particularly those outside Greater Boston, that they would benefit from better roads and transit access if the gas tax is raised. Globe reporter Matthew A. Viser contributed to this article.